In 2016, I surprisingly voted on the winning side of each and every State Question on the Oklahoma ballot. When I watched the results roll in on election night, I wasn’t sure if I should be worried that I was becoming more like Oklahoma or concerned that Oklahoma was becoming more like me. 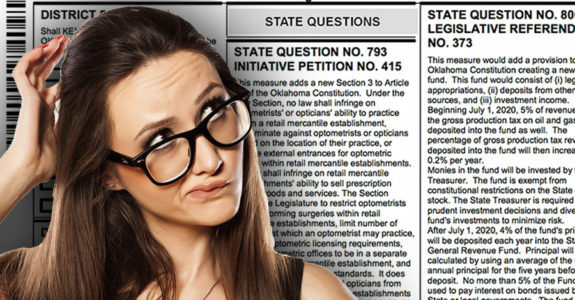 Since going to the mall for an eye exam isn’t weird enough, State Question 793 would allow optometrists to operate within commercial retail establishments, and open up the lucrative eyeglasses and contact lenses trade to national retail chains like Big Lots, Hobby Lobby and Discount Tires. At least that’s how I interpreted it. SQ 793 was, naturally, backed by Walmart and other large retailers. I guess the rationale is, if you’re going to put Oklahoma liquor stores out of business, you might as well go for the locally owned optometry practices, too. Anything to lower prices, provide more access to consumers and increase profits for out-of-state shareholders, right? 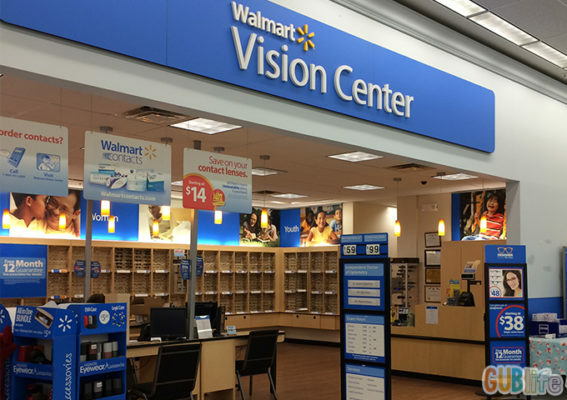 Yep, if you’re allowed to get an eye exam from a licensed optometrist inside a Walmart, you’re going to die of cancer. Yeah, our current state laws regarding optometry are a bit dated and protect optometrists, but haven’t we given Walmart enough over the past couple of years? Plus, out of all the candidates running for public office and all the State Questions on the ballot, only one group placed a political ad on The Lost Ogle – the optometrists against SQ 793. Protect small businesses and support those who support obscure local social blogs. Vote No on SQ 793. Since we now live in a society where everyone is a victim, it shouldn’t be a surprise that we have a state question on the ballot that will give victims even more rights, under the law. (5) allowing victims to refuse interview requests from the defendant without a subpoena. This state question is the wrong mechanism for advancing victims rights. Granting crime victims rights equal to the accused in criminal proceedings undermines due process and if passed would almost certainly exacerbate already alarming inequalities in our criminal legal system. There are much more effective ways to protect the dignity and rights of victims. We must strive to do so in a way that honors the Constitution and does not pit the interests of victims against the rights of the accused. Additionally, some groups are saying Marsy’s Law may not pass a legal challenge. A similar law was struck down in Montana, and the concern here would be that it violates our constitutional single subject law. Although Marsy’s law may be a bit regressive and use the state constitution to over-solve a problem it already kind of addresses, I’m probably going to Vote Yes. I think the odds are higher that I’ll be the victim of a crime than an actual criminal, so I’m going to do what most Oklahomans avoid and vote in favor of my self-interests on this one. If you don’t want victims’ rights to interrupt your rights to a fair and speedy trial, don’t commit a crime. One of the toughest decisions an Oklahoma voter faces when entering the ballot box is who to vote for in the Lt. Governor’s race. If you’re like me, you probably spend countless hours watching video of candidates cut ribbons with gigantic scissors and dig holes into red dirt with golden shovels to see who’s the most qualified—only to follow your heart and vote for the person with the coolest name at the end. If passed, State State 798 would make that tradition a thing of the past and put Governor and Lieutenant Governor on the same ticket. Although it gives the Governor more control of government, consolidates power to the ruling class and will probably be something we’ll all regret down the road, it seems to make sense. The biggest complaint about SQ 798 is that, if passed, it lets the Oklahoma legislature determine the process for how the Lt. Governor will be chosen. They’ll probably create a tribunal of wealthy business leaders, Baptist ministers and Oil Overlords and let them decide. Considering that’s how most Oklahoma policy is created, I guess that will work. Once again, we may regret this down the road, but if it saves us all two seconds of time at the ballot box, it’s probably worth it. Starting in 2020, SQ 800 will take 5% of the revenue the state collects each year from the gross production tax, increase the amount by .2% each year, and put all the money into a trust fund called the Oklahoma Vision Fund, which will probably be used down the road to give subsidies back to oil and gas companies. That’s how the system usually works, right? Although it’s good for government to save money when times are good to help pay for services when times are bad, I’m not so sure about this legislation. First of all, Oklahoma already has two reserve funds. One of them, the Revenue Stabilization Fund, already receives a portion of gross production tax collections. Second, this law was obviously crafted and pushed forward by the Oil Overlords, which basically means the true intent of the legislation is unknown and shouldn’t be trusted. I trust Oil Overlords on where to find natural resources and the most expensive steakhouses, and that’s about it. We literally just passed the increase in gross production taxes. Let’s first use the money to fund education, and if it turns out we can afford to put some in a trust fund down the road, let’s do it at that time. When I first saw the name of this state question, I figured it would let school districts build mills to employ students on the fifth day of a four-day school week, but then I discovered a millage – which spellcheck wants to change to “mileage” – is some fancy way to determine property tax rates. Since I have no clue what I’m talking about, here’s the ballot language. Currently, monies from this fund may only be used to build, repair, or remodel school buildings and purchase furniture. This measure would amend the Constitution to permit voters to approve such a tax to be used for school operations deemed necessary by the school district, in addition to the purposes listed above. The only thing I really took from this SQ is that it gives more power and authority to local school boards on how they get to spend millage money, so if it passes, expect a bunch of new 10 Commandment statues and Confederate flag monuments popping up in Southeastern Oklahoma. In all honesty, I have no clue if this is good policy or not. If only we had elected representatives around who could research and study these nuanced issues, determine if they’re good policy or not and then vote accordingly. Trusting Oklahoma-educated voters to fully grasp a complex issue like this just doesn’t seem wise. When in doubt, vote no. Anyway, that concludes our State Question Resource Guide. To learn more about our state questions, do what I did and head over to Oklahoma Policy. Next post This Week’s Lost Ogle Trivia Theme: Bedlam! Hey Mikey – be sure you take your voter ID with you. Otherwise you won’t have the “right” to vote. If you’re registered to vote, “voter ID” can consist of either an Oklahoma voter Identification card, or any valid and current government picture ID, e.g., state driver’s license, state ID card, federal ID, etc., which will be compared with voter registration records at the polling place. If your ID matches, you’re good to go. If you’re not on the official voter roll, you’ll still be allowed to vote on a provisional ballot with valid ID. So go vote! Did you ever vote before? The Lutenant Governor question is nonsense. I’ll vote to eliminate the position, but I won’t vote to set up a party’s slightly better chance to appoint the next Governor. When the Governor is out of the state the Lt. Governor is the “acting Governor”. So when Mary was off in Washington trying to get a job we had Acting Governor Todd Lamb on the job. 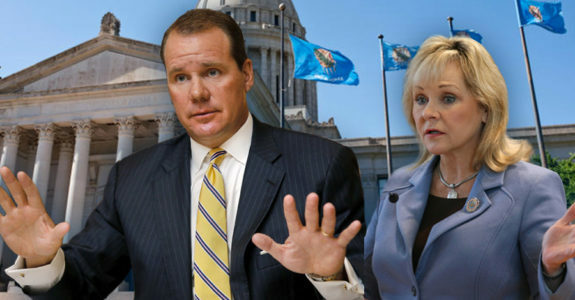 It’s not like the Governor has the nuclear codes or anything, but if something came up he was the Governor, until Mary hightailed it back on Okie One, the state’s plane. Rather than to make them a team, why not eliminate the ballot spot and make the person who came in second in the Governor’s race the Lt. Governor? This would incentivize the Governor to stay in the state, you know and lead, rather than to be off looking for her next gig paid for by taxpayers. Since the Lt. Governor also has the tie breaking vote in the Senate, having the opposing political party with that power would be interesting. I think on a NO on that state question. As far as letting optometrists work for Wal-Mart, or rent space there for less than their building, why not? They still have to perform their job under the same rules as they did when they were in effect self employed. We don’t have any problems with hospitals owning the doc-in-a-box clinic who hire doctors to work for them. Pharmacists that work for Wal-Mart have the same rules that Pharmacists who own their own pharmacy, and nobody seems to have a problem with pharmacists working in a Walmart. But yet we are led to believe that an optometrist working at a Wal-Mart, like they can in 47 other states is a huge problem. This state has far bigger problems to solve than these little diversions on the ballot to make the public think they are running the show here rather than those idiots we elected to represent us. I’m opposed to the notion, in general, that we need to run to the state constitution to change everything some group doesn’t like, so unless a SQ really changes something that needs to be enshrined, then I’m in general opposed to it. I got a flu shot at a Walmart pharmacy this year and didn’t keel over dead in the parking lot. I don’t see their optometrist being anything less. Have there been problems in other states? Or is Walmart really trying to destroy our eyeballs as these ads imply by putting a clinic in the grease pit of the Walmart oil change bay. They run hundreds of professional optometrist services and have for years. A “mill” is a tenth of a cent. It was actually a coin back in the day. Your grandparents might have kept a few as keepsakes, and mills turn up regularly at flea markets and swap-meets. They’re smaller than a penny, made of copper, and have a hole in the center. Not copper, but aluminum or another white metal. My bad. I remember plastic mills in St. Louis in the 1950s. Red ones were one mill, green ones were five mills. Of course two green ones were worth a penny. If you favored allowing Walmart to sell wine and real beer in their stores, then logically you should also favor allowing them to house optometrists and sell prescription eyeglasses. As Patrick pointed out, there don’t seem to be problems with Walmart housing pharmacists and selling prescription medication. Oklahoma is one of only about four states in which optometrists allowed to perform laser eye surgery. And Oklahoma is one of only three states that ban in-store eyecare at Walmart et al. How did optometrists arrange for such favorable treatment in Oklahoma? I don’t know, but what evidence exists that our state’s eye care is better than in other states? Vote yes on SQ 793. If you pause that ad and actually read what they highlighted, it simply says that licensed optometrist can enter into agreements that limit their practice in that location.. Fair enough. It doesn’t release them from their responsibility for the service they do offer. Walmart is their land lord. It doesn’t say that optometrist are allowed to do cheap second rate service using Old Roy from the hardware department to come and poke around in your eyes with a rusty screwdriver. . Optometrists offer various services and do so under the same state standards and rules as any other optometrist licensed in this state. Walmart can open a vision clinic in Oklahoma tomorrow. There is no law preventing it. The law is that the optometrist owns the clinic and gets the profits and leases the space from Walmart. Walmart would still sell and profit from the frames and lenses. They want all of the money. That is what this bill is about. It’s all about the money for the optometrists too, although their advertising would lead us to believe otherwise. In the end, so very many questions are all about the money but pretend otherwise. Which scheme is more beneficial to consumers? That’s the way I voted. the optometrist issue is strictly is stricty about the optometrists fear of losing a little money…Quality eye care will not stop…It doesn’t seem to bother you that Wmt has pharmacies!!! Marsys law as they call it was struck down in Montana because it was crap its being pushed in every state they can get to take the bait….